The Rio Salado Defensive Pistol IDPA match is held the 2nd Wednesday of each month. The start time is 6:30 PM. Check-in begins at 5:45 PM and closes at 6:20 PM to ensure on on-time start. Register online on Practiscore at Upcoming Matches at the RSDP Club . At Rio Salado we see IDPA matches as a place to compete with “real world” off the shelf guns (or even with your actual carry gun) and minimal additional gear. The stages are designed to test and build your gun handling skills and shooting ability without straying too far from what might be required in a defensive situation. But it is not training, and as a game has rules that must be followed for range safety and equitable scoring. As a new shooter, what do I need to do? First, you’ll need to take the Practical Shooting Starter Course before shooting any of the Practical Division matches at Rio Salado. This class will cover the generic match rules including the range commands plus when, where, and how you may handle your gun and ammunition. If you are just new to Rio Salado practical matches and are classified above Novice in IDPA, USPSA, ICORE, or TNS you do not need to take the PSSC. I’ve met the prerequisites, what do I need for IDPA? You will need an IDPA legal gun, magazines, and holster/magazine holders/belt setup. You will also need a concealment garment (the notorious “fishing vest”). The short version on equipment is that you will need a single belt that threads through your belt loops, a strong side hip holster that covers the trigger, and magazine carriers. We recommend that you read the IDPA rule book available here for the full details on scoring and the equipment requirements for the different divisions. What guns are suitable for the various equipment divisions in IDPA? SSP (Stock Service Pistol) = Full size plastic striker fired or metal double-action-for-the-first-shot pistols with limited modifications. 9mm or larger, 10 rounds max mag capacity. ESP (Enhanced Service Pistol) = Full size pistols, all action types with a wider range of modifications allowed. 9mm or larger, 10 rounds max mag capacity. CDP (Custom Defensive Pistol) = Full size pistols (typically 1911s) in .45 only, 8 rounds max mag capacity. 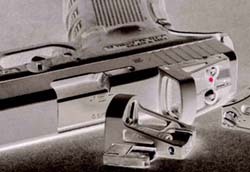 CCP (Compact Carry Pistol) = Compact pistols with barrels 4-3/8″ or less, all action types. 9mm or larger, 8 rounds max mag capacity. REV (Revolver) = 6 round maximum, .38 Special or bigger for speed loaders and .357 or bigger for moon clips. What about guns that hold more than 10 rounds in the magazine? You can use them but you can not have more than the division capacity in the magazines after the start signal. Once you have the gear and are ready for your first match this list summarizes the key rules: IDPA 1st match shortcuts.